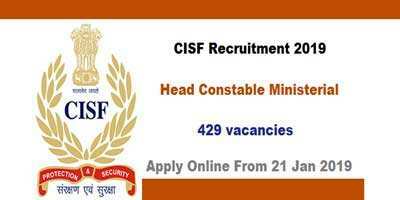 CISF 2019 Recruitment Notification OUT: Central Industrial Security Force (CISF) going to conduct the recruitment process for the 429 posts of Head Constable (Ministerial). Candidates, who aspire to join the Central Industrial Security Force, to serve the nation, can apply for CISF Jobs 2019 through the online mode. The online application form will start from 21 Jan 2019 on the official website of Central Industrial Security Force. The application form will be accepted through online mode only. There is no other way to submit the application form. Online applications are invited from the eligible male and female candidates to fill the posts of Head Constable on temporary basis. Candidates, who meet the eligibility criteria, can apply for the CISF Head Constable Jobs 2019 before the last date. For the other details such as age limit, qualification, salary and selection process, read the notification given below. Candidate Should be Intermediate or 10+2 from a recognized board. CISF Jobs 2019 for Head Constable is a marvelous opportunity for those candidates, who are looking for a Defence job. Candidates who possess the prescribed qualification and fulfilling all eligibility conditions can apply online for the CISF Recruitment 2019 before the last date. CISF online applications for the posts of Head Constable will start from 21 Jan 2019 on the official website of the Central Industrial Security Force. Candidates fulfilling the eligibility criteria may apply for the CISF Recruitment 2019 through online mode. We have advised the candidates to read the official notification, before filling the application form.